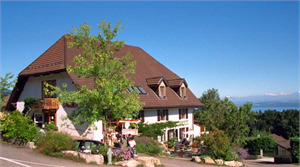 Hotel L'Aubier Neuchatel - Book now! Simple and charming, its nine rooms located on four floors above the café welcome you in the heart of the old town for a night or more. Each room has its own style, ambiance and colour. Three rooms have a small bathroom with shower en suite. The others have just a basin, with toilets and showers located on each floor. The Café team looks after the house until 19:00 (Saturdays until 18:00). We would appreciate it if you could arrive during the café’s opening hours. CAR: 5 minutes walk from the Parking du Seyon or the Parking du Lac. Typical and joyful villages following each other, vineyards as far as the eye can see, a university and medieval city, friendly lakeshores, a lake reflecting an urban yet country landscape at sunset: the Neuchatel lakeshore is one of Watch Valley gems, a genuine paradise on earth with dolce vita atmosphere.